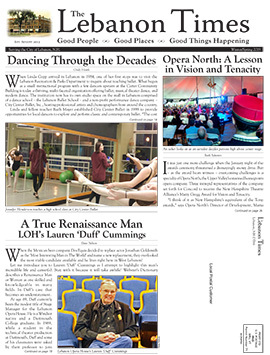 Editor’s Note:The Lebanon Times will land in your mailbox every quarter, no subscription or payment necessary. It’s our privilege to bring you all the good news we can! But it still takes a good bit of capital to mail each issue to every household, business, and organization in the city – and that’s where our mailing sponsors, Mascoma Savings Bank and Amcomm Wireless, come in. We’re pleased to have their support behind our very first issue, and to feature them here so you can learn more about their efforts to do good in the community. Mascoma Savings Bank has always aimed to serve the best interests of the community. For that reason, when Marketing Director Samantha Pause was asked to share in sponsoring the mailing of Lebanon’s very own, good-news-only publication, she jumped at the opportunity. By co-sponsoring the mailing, Mascoma Savings Bank makes it possible for every household, business, and organization in Lebanon and West Lebanon to receive good news in their mailbox every quarter. Mascoma knows how important it is to help create and maintain a vibrant, healthy, and prosperous place to live and work. As President for 23 years, Steve Christy has been a solid force behind the Bank’s do-good philosophy. Mascoma Savings Bank has been mutually owned since 1899. This means that it is not for sale and thus is able to maintain its commitment to reinvesting profits in the community. Its first priority has always been – and will always be – its customers. In 1988, it established the Mascoma Savings Bank Foundation, funding it with $1,000,000 for the purpose of giving back an “ongoing dividend,” in the form of grants, to the communities responsible for the Bank’s prosperity. As of April 2013, $2,927,252 had been granted to nonprofit organizations. When asked what has influenced the Bank’s mission to serve its community, Steve points to the people behind the institution. “We’ve been very blessed for a long number of years to have had a great Board of Directors, a great staff, and great customers. Being mutually owned has played a significant role in all of this. We know when we come to work in the morning and we know when we leave at night who we are working for. We get to think about what is truly the best thing for our community, our customers, and our employees. And I think that helps in making decisions,” says Steve. Individuals wishing to contribute to the Foundation may mail a check made payable to the Mascoma Savings Bank Foundation to 67 North Park Street, Lebanon, NH 03766. For more information visit mascomabank.com. When Lebanon resident Cinnamon Murray and her husband, Brent, opened their first Amcomm Wireless location in West Lebanon nearly eight years ago, it was the only Verizon Wireless retailer in the Upper Valley. Despite the many competitors that have sprung up since then, the company is no less unique. The Murrays “designed the company a little differently than the way a lot of retail sales environments work,” says sales manager Jeff Temple. Employees aren’t paid on a commission basis, and customer service is the top priority, attracting business from as far away as Warner, N.H., and Randolph, Vt.
Another priority is supporting other local businesses, part of the reason the owners chose to sponsor The Lebanon Times. “The whole ‘good people, good places’ thing really struck a chord for me, and I think it resonates what the Upper Valley’s all about,” he says. Jeff moved to the area in 2010. Dissatisfied with the food service industry, he answered a help wanted ad that would eventually turn into “something fantastic”: His career at Amcomm Wireless. The first staff meeting, held as usual at the Murrays’ Lebanon home, let him know this was a different kind of company. “It was as much a social event as it was a business meeting,” he recalls. “Everybody was having a good time and really enjoying being a part of something bigger than themselves.” Jeff says the owners’ loyalty to their employees has earned high performance in return. “You take care of your people, they take care of your customers,” he says. Amcomm Wireless participates in Toys for Tots every year and has raised funds for David’s House. And the company plans to be even more active in community service. Anyone with ideas for volunteer projects the team might take on may email him at jtemple@amcommwireless.com. Jeff himself won’t be going anywhere soon.